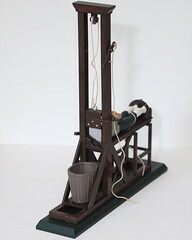 Model guillotine, originally made by Aurora, but now produced by Polar Lights. This was part of the Chamber of Horror series of model kits that was available in the 70s, at least that’s when i remember it from. But checking against the old Aurora catalogs on majormattmason.net, it would appear to date from the late 60s. Sadly, it seems that Polar Lights have dissapeared, like Aurora from the model scene, as their site www.polarlights.com just goes to the toy company Ertl. Now that is an intense little toy!